That’s right. Move over Meebo. Move over Yahoo Messenger, GTalk. Digsby on the covers will look like one of the dozen multi-protocol Instant Messenger clients out there. But, this is by far the best integration I have seen among them. I am not just going to say that but actually tell you why. Garry Conn asked me on Twitter why I liked it so much and here you go, Garry! Digsby integrates not just your IM accounts but also your email accounts and your social network accounts like Twitter, Facebook and MySpace. Support for multiple IM networks. Nothing new here. It supports Google, Yahoo, MSN, AIM, ICQ and Jabber. Tabbed conversations. You can chat with multiple buddies with just one window. If your buddy is on multiple IMs, you can merge their accounts into one in Digsby. Your buddy has a weird number in his/her name? Give him an alias. This is the best part. You can have Digsby minimized but new messages will popup and you can reply from within the popup and get back to what you were doing! Setup various alerts for individual buddies like a sound and/or a popup when a friend logs in or logs out. 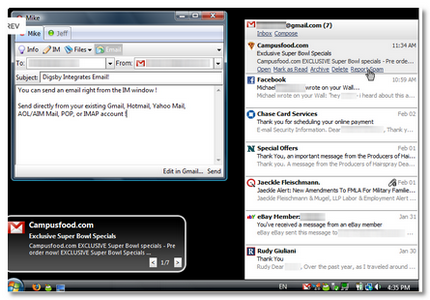 On login, a InfoBox popup shows you new email messages and you can scroll within the popup to see all messages. A taskbar icon for the email account showing unread messages. Clicking on the icon, popups a box with latest message and you can Mark as read, delete, archive messages without ever opening up the browser. You could also go to the Inbox or the Compose screen right from here. You can send email directly from your Digsby Contact List from the IM window. Best Twitter integration I have experienced so far – Timeline view, replies, direct messages. Plus, every contact looks just like the twitter web interface with the Favorite star, a reply icon, etc. Update your status easily and new Tweets popup (configurable) in a nice little window. Support for more networks coming soon. Digsby has many more features to list here. And did I say it looks gorgeous with capital G in Vista? Sometimes, applications gets overloaded with features and casual users will get lost. Not with Digsby. Every feature has been implemented very naturally and probably better than the app maker themselves in certain instances. Personalization options are another option you have to see it to appreciate it. Just the whole look and feel is very user friendly. Nevertheless, this is a great piece of software that’s availabel for free. If you are a Mac/Linux user though, you’ll have to wait a little longer but they promise to have one for us nerds soon. The latest release of Digsby is loaded with crapware and you have to watch out for it while you install it. Plus, there is a hidden research module that will use your computing resources when your computer is idle. Read on to see why Digsby is NOT my favorite instant messenger at the moment. I’ll blog about it if it works. Martin Welch’s last blog post..Dr. Martin Welch Research Works! Owen.. I checked out your blog and will keep an eye on it to see if you can run it in wine. I’d be very interested, if you could do it. Keith, glad to see you agree with me. I was a little hesitant to go all out and say it is my favorite when there are a dozen alternatives out there! But, the more I use it the more I love it. It has to be teh next best thing for me after Enso. I have Digsby installed and I really don’t have any complaints. The only thing I have a problem with is that the list of messenger protocols is a bit small in comparison to Pidgin. Which is why I use Pidgin instead of Digsby. When Digsby adds stuff like IRC support, then I’ll make the full switch. Hey thx for sharing this cool IM. I have tried this and have been using this ever since then. Got rid of all the clutter. Nishit’s last blog post..If you’re so smart, why aren’t you rich? Digsby is pretty decent one, the problem I faced is the connection to Gtalk, its not connecting properly for me. K, I’m not into instant messaging (I can’t get any work done as it is! ), but this looks like a great option for those who do. Digsby has lots of privacy concerns, someone hacks your diggsby account, they instantly gain access to all messengers and social networking sites registered with it. It’s one problem among many with Digsby, it may yet come to form and be a useful IM, but, as long as it’s required that you store information on the Digsby server it will not be a client I use. digsby is really a nice little all in one instant messenger i am also using it from a quite long ago. i really like all in one apps. Hi K… Digsby has come a LOOOONG way. I have been using it (thanks to your blog post) every since you posted. Going through the latest round of beta’s has turned Digsby into a huge potential contender in the IM market. I use it for everything and the best feature of all is the multiple google-hosted mail account notification.. It is invaluable to me. Sounds really a good instant messenger. I wonder if this has an application for Android? I’d like to have this on my phone.